“From this moment, the North-South relations will be put at the state of war, and all the issues arousing between the North and the South will be dealt with according to the wartime regulations,” North Korean state media outlet KCNA said today. “If the U.S. and the South Korean puppet group perpetrate a military provocation for igniting a war against the DPRK (North Korea) in any area… it will not be limited to a local war but develop into an all-out war, a nuclear war”. KCNA added that the “time has come to stage a do-or-die final battle”. But despite the increasing rhetoric, Denis Samsonov, a public relations officer working at the Russian embassy in North Korea, told Russia’s NTV that the situation in Pyongyang remains “calm”. “Basically, life in the city is as usual…We are witnessing no tension.” The Russian Foreign Ministry ambassador at large, Grigoriy Logvinov, told Interfax News that although he hoped all sides would “show restraint”, Russia would not “remain uninvolved under conditions when tension is fomenting near our eastern borders”. In the U.S., the White house said that it would be taking North Korea’s threats seriously. ”We’ve seen reports of a new and unconstructive statement from North Korea,” Caitlin Hayden, spokeswoman for the National Security Council told AFP. Meanwhile, Beijing based experts talking to Chinese media said that Thursday’s deployment of B-2 bombers, which can carry up to 16 nuclear weapons, was a “shock-and-awe” symbol of U.S. escalation. On CCTV’s “Focus Today”, North Korea expert Li Li said the bombers’ deployment was a reflection of the U.S. attempt to “counter North Korea’s nuclear weapons with nuclear weapons.” Xinhua News, a Chinese state news outlet, pointed out that “it’s time for both sides to take a step back and let the cooler minds prevail”, weary of the escalation of threat. However, North Korean media added in a later bulletin that in the event of conflict, victory would be “certain”. Pyongyang has threatened attacks almost daily since it was sanctioned for its February nuclear test. Some observers suggest the threats indicate the potential of regime instability. 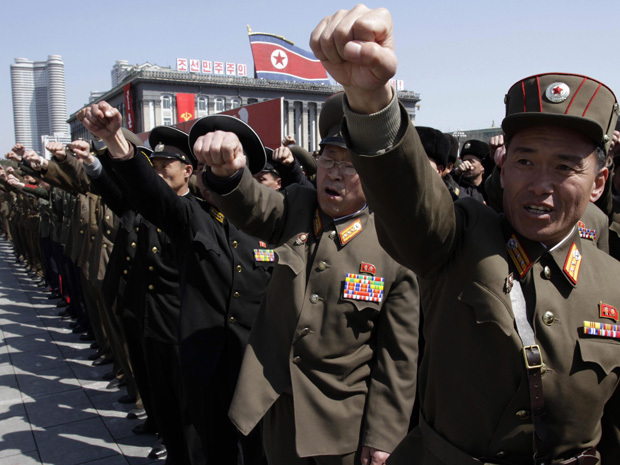 Few think though that North Korea will follow up and actually commence major hostilities.